Connecting RGB LED to Arduino. Obviously, connecting a common cathode RGB LED to Arduino is different from connecting a common anode RGB LED. Here is a Fritzing diagram on how to connect a common cathode RGB LED: On the other hand, this is how you would connect a common anode RGB LED: See the difference? For a common cathode LED, the common pin is connected to GND. For a common anode LED�... This project is using a common anode RGB LED, so the longest pin of the LED is connected to 5V, whereas the three other pins are connected to three Arduino pins via three 220 ohm resistors. The first pin (left of the longest one) is controlling the Red LED, the third pin is controlling the Green LED and the last one is controlling the blue LED. 2/05/2016�� Learn how to wire up an RGB LED strip to your Arduino and see the basic code for how to control it. The code for this video can be found here: https://github... Learn how to wire up an RGB LED... 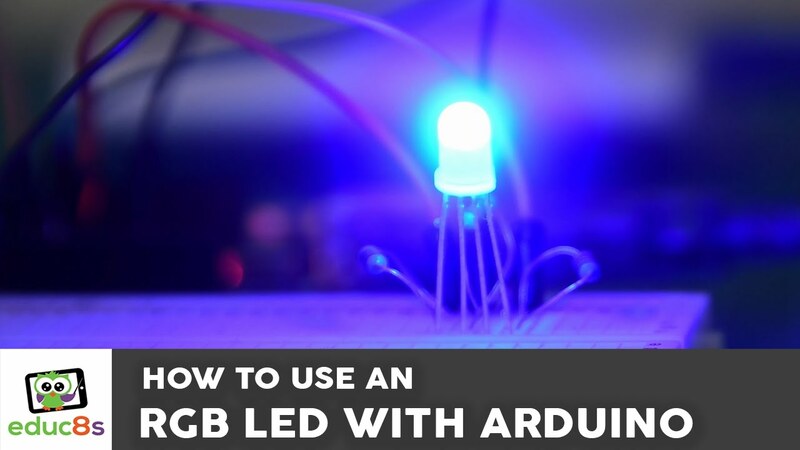 The Arduino Starter kit with 15 arduino tutorials, lesson 5: Color RGB LED Let�s start with a new component: an RBG LED. This component combines red, blue and green LEDs and can display various colors by adjusting the different values of each light. The single RGB LED that I used in the first place had a GND, R, G, B pins, so I simply connected R,G,B to individual pins on the arduino and the GND to the GND on the arduino, I�m assuming the + was coming from the R,G,B pins. Since this strip has +12V, I�m assuming each of the colour pins R,G,B must be GND. How do I go about connecting it?... This project is using a common anode RGB LED, so the longest pin of the LED is connected to 5V, whereas the three other pins are connected to three Arduino pins via three 220 ohm resistors. The first pin (left of the longest one) is controlling the Red LED, the third pin is controlling the Green LED and the last one is controlling the blue LED. The connections are pretty simple. We connect the ground pin (pin 2) of the RGB LED to the ground terminal of the arduino. This grounds all of the LEDs pins. This project is using a common anode RGB LED, so the longest pin of the LED is connected to 5V, whereas the three other pins are connected to three Arduino pins via three 220 ohm resistors. The first pin (left of the longest one) is controlling the Red LED, the third pin is controlling the Green LED and the last one is controlling the blue LED.